For an overview of OSCII, please click on the map above [PDF - 680 kB]. The Organic Science Cluster II (OSCII) focuses on innovation, competitiveness and market development to ensure Canadian organic producers and processors have the tools and resources they need to continue to innovate and capitalize on emerging market opportunities. Organic agriculture in Canada is a federally regulated and inspected production system driven by growing consumer demand domestically and internationally. It is a model of food production that is guided by principles of sustainability in terms of environment, resources, economics and animal well-being. As such, the research and development priorities for organic agriculture may span all commodity groups and applies to the entire value chain, from production through to the consumer. Innovation, the application of knowledge generated by science that leads to an improvement in the way things are done or a product being diffused into the marketplace, is needed for the organic sector to be competitive and to grow and prosper. Innovation may address barriers constraining production, increase efficiency of production by reducing cost, or support capturing new opportunities. OSCII includes a number of examples of innovation: crop breeding for improved cultivars, reduced tillage systems under organic management, use of biological soil amendments to improve plant health, development of new management products and practices for pests of crops (insects, diseases and weeds) in field and storage and livestock (diseases and parasites), technological advances in greenhouse and high tunnel production, management targeting optimization of the nutritional value of crops, the use of advanced processing techniques to develop value-added products such as nutraceuticals, improved methods of meat preservation, and utilization of waste byproducts to enhance productivity. OSCII will help producers capture opportunities by supporting the development of emerging and juvenile organic production in Canada that is responding to market demand including: hops, nutraceuticals, sprouts, ornamental potted plants, and poultry. OSCII is supported by over 65 contributing partners on 37 Research Activities. OSCII includes over 170 collaborating researchers at over 36 institutions across Canada. 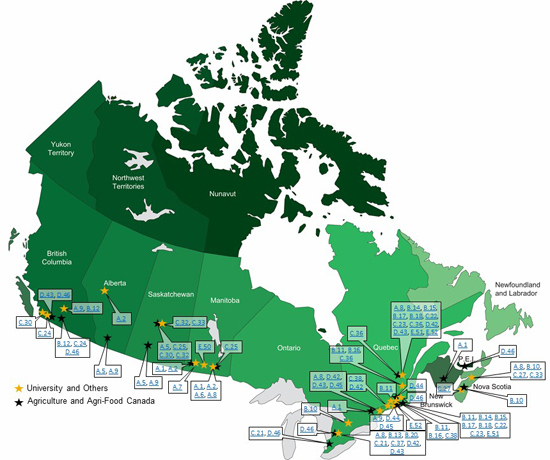 For more information, also see the Agriculture and Agri-Food Canada and Dalhousie University press releases.